Rizhao Xueqing has become a Tea Trekker customer favorite Chinese green tea. 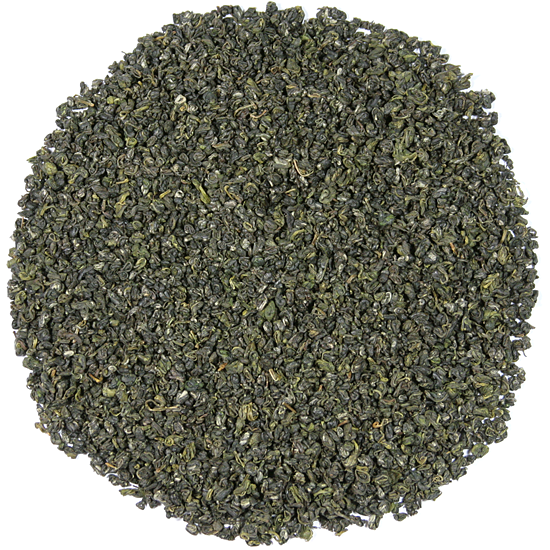 This tea is well into its fifth year as a member of Tea Trekker’s collection of premium Chinese green teas, and we are quite pleased with its flavor profile and consistency of quality from season to season. It is one of the ‘early spring’ green teas that can float between being a PQM and a Yu Qian, as its harvest is often just on the cusp of the timeline for these two harvest periods. For 2018, this tea definitely has the flavor development of a Yu Qian tea! Rizhao Xueqing has well-shaped, neat, compact, tightly-curled leaves that are deep green in color. The flavor is big and sweet in the cup – buttery and full – and the fragrance is stunningly fresh. This is a very impressive tea that has more ‘oomph’ than many leafy Chinese green teas, so for those looking for substance in the cup, we highly recommend this delicious tea. This is not a complicated tea, but a tea to drink with gusto. Our Rizhao Xueqing is the same premium grade as last year’s tea – a ‘super-grade‘ from the 2018 spring harvest. It is not the usual ‘tourist-grade’ tea sold to visitors at touristy temple sites in this sacred Buddhist region. In a country that began to develop tea and tea culture over a thousand years ago, this tea, which was first created in the late 1960’s and early 1970’s by the China Tea Research Institute in Shandong Province, is a modern newcomer. While it has no august pedigree that connects it back to the Tang dynasty or another historical tea period, it has the distinction of being,….. well, mighty delicious and distinctive. Starting with a rudimentary geography lesson, Shandong Province lies south of Beijing and north of Shanghai. Rizhao Xueqing is made in the Mt. Laoshan range, which is the largest coastal mountain range in China. This range consists of several mountains – Mt Fu, Mt Zao’er, Mt Shuangfeng, Mt Dading, and Mt Taizi, but is known collectively as the Laoshan. Mt Laoshan is a sacred Taoist mountain; however, meditation and solitude is optional when drinking this tea. The highest peak lies at just under 4,000 feet above sea level and much of the footprint of the mountain mass juts out into the Yellow sea creating a coastline of bays and coves, somewhat similar to the topography of Maine in North America or Brittany in Europe. Mt Laoshan is comprised of a high percentage of granite rock, which gives the soil unique growing characteristics. Locals say that the tea from this region has good energy. The ‘yang’ of its granite peaks and the ‘yin’ of the Yellow Sea creates good tea ‘qi’. We could not agree more! When we visited this beautiful region we were struck by the ‘oceans’ of bamboo that rustle in the mountain breezes and create a gentle background sound that is simutaneously calming and refreshing. The residents of the area are exceptionally proud and honest, with a kind heart.